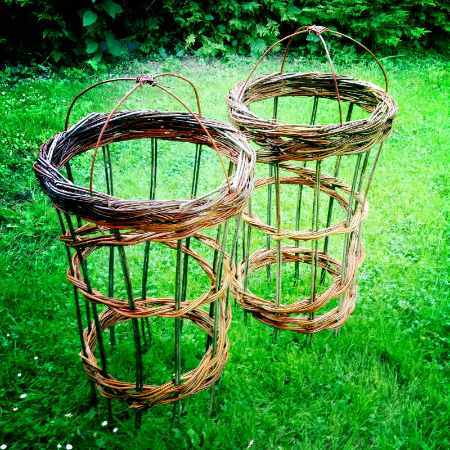 In this workshop suitable for all levels of experience we will be using traditional basketmaking techniques and english willow to produce these attractive and useful additions to any garden. You can expect to be able to make 2 plant supports or a support and a planter in a day. On this course, usually everyone starts with a simple spiral plant support, but we often end up getting pretty creative! We will be exclusively using local, organically grown willow in a selection of beautiful colours - and this year we have a new willow supply. The willow bed is planted in the form of a labyrinth, and there are many varieties, offering us lots of colours, including bright yellow, rich claret, dusty purple, brown and apple green. Enjoy a restful day of creating in delightful surroundings – Blacksmiths Cottage is situated in 2 acres of lovely garden and woodland - and go home with something new for your garden and a real sense of achievement.